What could a marathon training teach us about innovation? As an athlete and innovator I am interested in the connection between marathons and innovation. In order to define a “innovation process” within the athletic for looking to get a better result in training, time competition and satisfaction, I want to share the experience of my participation in the 40th NYC Marathon (November 1st, 2009) clocked 3:00:55 and in the 114th Boston Marathon (April 20, 2010) with a record of 2:55:42. For this I followed a “strategic process” or “methodology”. Prepare for a marathon also requires a strategy, new ideas, perseverance and effort. Linking athletics with innovation we can focus on the explanation that Vijay Govindarajan gives respect to the identification of non-linear changes in the example of the history of the high-jump event at the Olympics. There have been four distinct “business models” in the high jump. Each enabled athletes to achieve breakout performance, and each shift has transformed the high-jump “industry.” In each case, the inventive high jumpers were not just managing the present, they were creating the future. The first step is to identify a competition, sports tournament, physical activity, training group, and define a strategy to achieve the goal. At this point I recommend analyzing and evaluating how is your level of competence in the present: performance, best personal results, health, weight, what are your biggest rivals or competitors and focus on benchmarking of other athletes. Then you need to plan for the future competition that allows you to grow as an athlete. Focus on tomorrow’s competitors, and participate in new competences. Defines the competition, distance and mark (time) you intend to achieve in the competition. Generates you (the) concept as sportsman/athlete. If you practices many sports, you could to specialize in one. Generates ideas to help you achieve a greater sports development. According to a previous problem you had (bad results, injury, illness, altitude and climate conditions) generates a lot of ideas that allow you to overcome this problem and achieve your sporting goals. Think and create new training practices that can help you. Analyze what has been your best result in the objective competition, or you have not done before? In accordance to your best and worst results (race track results, middle-distance race or long-distance race) and according to athletic concept defined in phase 2, you should to evaluate your current conditions and your athletic ability. I recommend that you participate in competitions of greater or lesser distance, comparisons by time (time for each km) and analyze the results. Set the date for the great competition you want to do, analyze the route and altitude level, organizes the trip if is necessary. Create or integrate a sports platform, training team and support: food, medical and psychological. I recommend you follow a previously defined training plan, you should support you and work closely with the sports platform. The greatest strength at this stage is perseverance-effort-discipline. 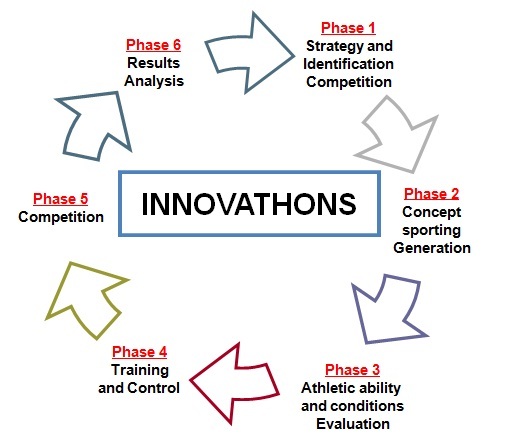 During this stage exists the possibility that you align to a disruptive innovation (Clayton Christensen) when the firsts competitions may not get the expected results. After passing the training period, came at last the great day of competition. But this stage not just about competition but also to pre-planning you must do with your support team days or weeks before the competition. There are several factors that must control hours earlier before the competition, such as food, time, clothes and shoes, chip, etc. In the competition must maintain high motivation and remember that it is a race that you’ll enjoy. Analyze the results achieved and feel so accomplished winner. Analyze the positive/negative factors that you feel in competition and discuss them with your team. If the result wasn’t favorable, forget the past and learn from this experience. Again, continue your cycle Innovathons. The innovation helps us to improve the NPD process to have a better value proposition, but also helps us improve our lifestyle and sports. Geovanny Romero is a Chemical Engineer with great experience in manufacturing with a variety of companies in Latam and Europe. He is also a Researcher in Foresight and Innovation, and a Board Member for PDMA Mexico – Northern Region. That is an awesome time for the NYC and Boston marathon. Thus good but communication is very important ie Language, written, advert. An important and clever article that brings about a methodology for succeeding in a competitive task. This winning award essay is written by Geovanny Romero, a successful Ecuadorian professional which is living and working right now in Mexico. Thanks for your kind of words. I’m glad that article it was interesting for you.